Delicious confetti cupcakes packed with protein, low carb and every bit as yellow as birthday cake without the calories! Mix together all ingredients: 3/4 cup spelt flour, 1/4 cup almond flour, 1 cup sugar free fat free cheesecake pudding, 2 scoops cellucor cor-fetti whey protein powder, 1 cup egg whites, 1 tsp vanilla extract, 1/2 tsp baking powder, 1/4 tsp sea salt, 2 tbsp stevia and 1 tsp butter extract. Bake ingredients at 350 degrees for about 22min. until cooked through. 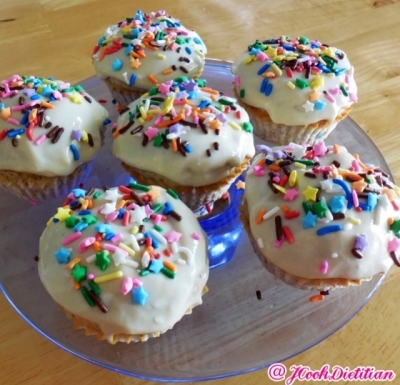 Mix frosting ingredients: 5 stevia drops, 5 tbsp. light cream cheese, 1 1/2 scoops cellucor cor-fetti protein powder, 1/2 tsp vanilla extract, 2 tbsp sugar free fat free cheescake pudding mix and 1/4 cup unsweetened vanilla almond milk. Top with sprinkles and enjoy!